This cross body strapped bag might be the “HIPPEST” purse you will ever have! The easy to follow instructions and the many descriptive photos make this sewing project a snap! Pattern includes instructions for 3 different bag styles. The inside zippered pocket is great for keeping your keys and other accessories. If you are not into sewing zippers, no worries, there are instructions to sew a simple inside pocket that is nice to hold your cell phone, and a nifty place to hold a pen, without a zipper! 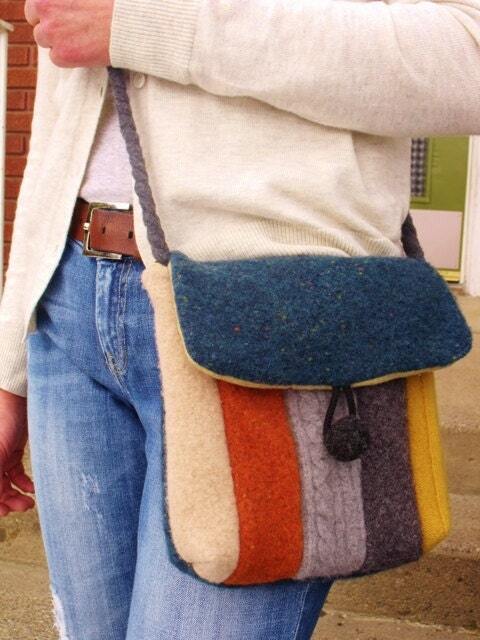 Braided fleece, that can also be recycled, is made into a unique and comfortable cross the body strap. Who would have thought? The finished bag measures approximately 9 1/2 x 9 1/2 inches, plenty of room for all your goods. I love wearing this purse! 	Approximately 5-6 inches, 1/8 inch cording or thick shoelace. © jhowell 2012. All rights reserved. These documents are for PERSONAL USE only. Please do not distribute, share or resell any of the files included. Thanks for an awesome pattern. Can't wait to see it come to life. I will just have to make more than one! Any FOUR Patterns - INSTANT DOWNLOAD!